Alaskan Natural Gold Nuggets US Standard 4 Screen - 4 Mesh that will sit on a 4.75 MM sieve. The Gold Flakes weigh 1/2 Troy Ounce, 15.55 Gram or 10 DWT and are Authentic Weight might vary a little do to different scales but you will receive 15.55-15.60 grams of gold. 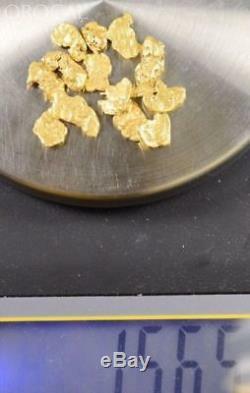 My Authentic Natural Gold Nuggets Flakes come from two main sources. One is located near Dawson in the Yukon Territory. Skagway was where the miners of the 1898 Klondike gold rush traveled through to reach the gold fields. This is the reason I describe them as Alaskan Yukon BC Nuggets. 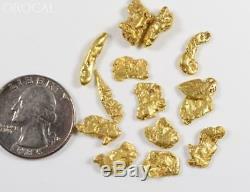 The Gold Nuggets you will receive will come cleaned but will not be the exact gold flakes pictured. They will be the correct size. Assay of this lot will range from 75-85% purity. All Nuggets are Pictured or Partially Pictured with a U. Quarter which is 24.5MM in diameter to give you an idea of size proportion. Weight might vary a little do to different scales. We do our best and double checked all our weights. We also check our scales daily with balancing weights but realize they could be off. If you feel they are more than that please let us know and we will consider given you a credit. In November of 2013 I opened up my Gold Nugget store. With thousands of satisfied customers I will continue to strive to provide the highest quality, largest selection and best priced gold nuggets on. The item "Alaskan-Yukon BC Natural Gold Nugget #4 Mesh 1/2 Troy Ounce 15.55 Gram 10 DWT" is in sale since Friday, October 5, 2018.